The White Kousa Dogwood shows off in spring with a stunning and abundant floral display. The pretty green leaves highlight the lovely four bract flowers. In fall the show goes on with reddish purple autumn foliage. In its youth this dogwood has a vase shape but as it matures the canopy becomes rounded. At 20 to 30 feet tall and wide at maturity this flowering tree is small enough to fit in most landscapes, but large enough to offer shade for most of the year. Buy shade trees online at our North Carolina nursery! The Kousa Dogwood is native to Japan and China while the Flowering Dogwood is native to the eastern United States. The Kousa Dogwood is more disease, pest, and deer resistant. Cornus kousa is considered more cold hardy than Cornus florida, but the native flowering dogwood is more heat tolerant. 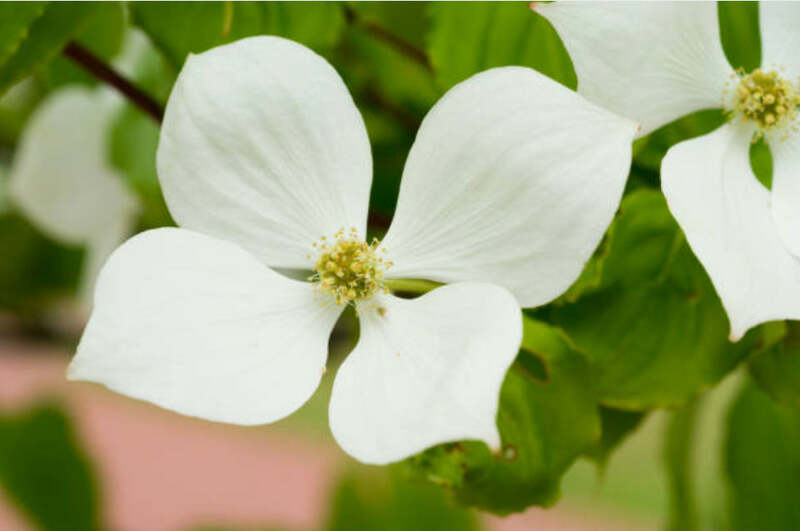 Zone 5 is the recommended coldest zone for both trees, but the Kousa is less likely to experience damaged buds or blooms because it blooms a few weeks later than the native dogwood. The kousa is recommended to a zone 8b where the florida can grow into a balmy 9b. The Kousa Dogwood has a larger fruit that is edible. A quick internet search will offer recipes for jams, muffins, pies and more. This unique fruit is rich in antioxidants especially vitamin C.
Kousa Dogwoods like full sun to part shade and soil that is well-drained, acidic, and nutrient rich. Once established, dogwood trees are drought tolerant. In extended dry and hot periods this tree will benefit from a weekly deep watering. Fertilize your dogwood tree in early spring for best performance. Choose a balanced slow release fertilizer. Dogwoods don't generally require pruning, but if needed, prune in late fall or early winter when the tree is dormant. The Kousa Dogwood is a lovely flowering tree to add to your landscape. It also functions as a shade tree. The roots of the Kousa Dogwood are non-invasive so they are great for planting near homes, pools, driveways, and sidewalks with no fear of issues. This dogwood is a standout as a focal tree in your front yard. Adaptable to sun or shade this tree fits wherever you want it to go. Buy trees online and have them conveniently delivered to your home. We have a huge selection of low maintenance trees.